The Brandon Seafood Festival is a family-friendly event so your children under 12 may attend and eat free with a paid adult AND 1 can of food. 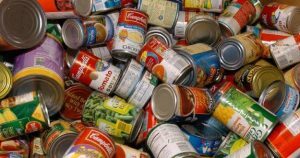 All the canned goods we collect at the event will be donated to ECHO of Brandon (Emergency Care Help Organization). We look forward to seeing you there. Just bring your canned good to the Registration booth on the day of the event which is Saturday November 2, 2019 from 11:00 AM to 3:00 PM and you are good to go. We will have a great time, rain or shine!